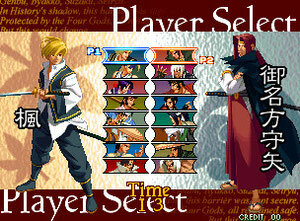 EX Mode : To enter EX mode, select your character first. Then, put the cursor on SPEED, and press C 6 times. Swith to POWER and press B 3 times; finally, go on SPEED and press C four times. EX mode then appears, and your character have both qualities of SPEED mode and POWER mode, but also can cancel certain moves in DM, and use his SDM when life bar twinkles and Power gauge is full. You can also enter special combos, but your life will decrease more rapidly and your attacks remove less life, while your Power gauge fills slower. Play Hagure (automatic mirror match): At the character select, go on Akari, and quickly enter 5 times C, 9 times B, 1 time C.
Play Naoe Kotetsu: Go on Shigen, then quickly enter 5 times C, 10 times B, 2 times C.
Play Kaede before Awakening: Go on Kaede, then quickly enter 9 times C, 1 time B, 4 times C.